The interview is intriguing in that it highlights the central role DMOs play as facilitators or inhibitors, through their marketing and branding work. The state of Kerala in India has branded itself as “God’s Own Country” and through its 2014 award-winning responsible travel marketing campaign, “When the World Comes to Kerala, New Worlds Open Up”. Kerala has experienced growth in visitor numbers, both domestic and foreign, since 2008 because of branding and marketing itself as a responsible destination. And these visitors are encouraged to consume authentic cultural products offered in the destination. On the other hand, New Zealand, with its “100% Pure” campaign has attracted criticism from media and travellers around the globe as greenwash, and that the campaign is not genuine about the true state of the natural environment in the country. New Zealand has recently reframed the “100% Pure” campaign to refer to culture, its people and the uniqueness of the experiences one might have when visiting the country. Although they are saying it is not because of the complaints, we can see how sometimes marketing can be an inhibitor of sustainable tourism, especially if such campaigns trigger strong growth in visitor numbers, but little improvement of destination sustainability. 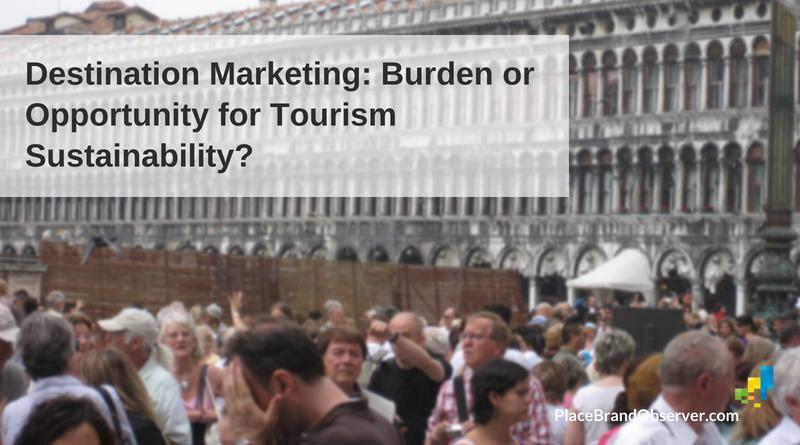 When destination marketing focuses on getting more visitors, as opposed to getting more revenue/value, it inhibits sustainable tourism and risks creating a mass tourism destination that responds to visitor needs and isolates locals. Destination branding may be detached from reality, in an effort to push for numbers. Credibility issues are never far from marketing campaigns or advertising – and this also applies to the messages used to promote destinations. What’s different now is that the amount of people travelling globally has increased to an extent that many destinations have reached or exceeded their carrying capacity. The result: unfavorable news coverage, critical comments and in general a stronger focus on the “dark side” of tourism. Overtourism – which is going to get worse in the years to come because of growth trends – is starting to affect the perceived legitimacy of tourism as viable economic activity (notwithstanding its job creation credentials), which means loss of goodwill and support from locals – residents and local governments. This, in turn, poses a serious threat to the image and reputation of a destination (town, city, nature park or region), and hence its mid- to long-term competitiveness. Destination marketers and managers are under pressure to make sure every single strategy, action, campaign supports rather than threatens the sustainability of the destination: environmental, social and economic.